Love the shape of this sink, first off. Then the design of coloring, featuring silver gray and black, giving depth and style. The guy that will be using it needs elbow room at 6’5 , so the remodel includes an antique buffet painted shiny blue for space AND good storage. And a large vigo faucet also purchased at Overstock in black. Shower tower from Overstock will complete the fixtures for a dynamic bathroom! Very happy with all purchases. Cannot wait to see the bath completed! Handcrafted in durable tempered glass, the VIGO Rectangular Titanium Glass Vessel Bathroom Sink is ideal for everyday use. The polished interior and textured exterior are stain-resistant and easy to clean. 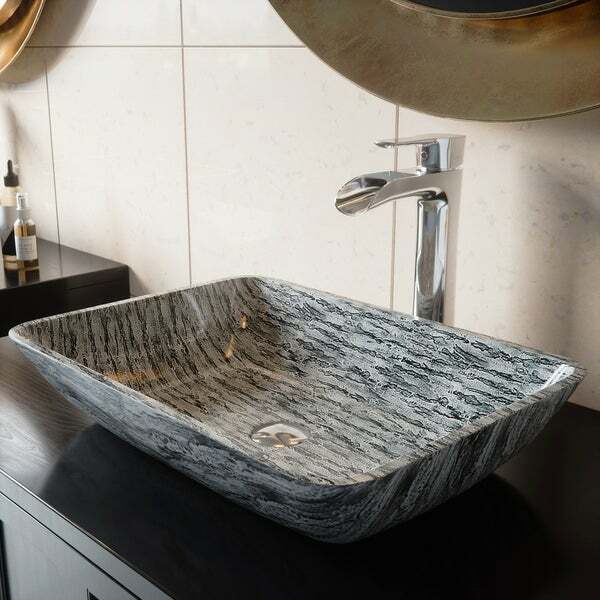 The sleek angular shape makes this bathroom sink unique, while its organic pattern of streaks and lines in glistening silver and black tones add to its wow factor and make this sink a perfect accent to any modern bathroom. Dimensions 18.13 In. X 13.0 In. X 4.13 In. What a beautiful, sturdy piece! Purchased this for my boys bath and it’s a showstopper! The color camouflages any water streaks or fingerprints so I don’t have to keep up with it too much. Beautiful glass sink. Looks great on Absolute Black granite with white cabinet in a bathroom with grey walls. Made the guest bath pop! I am extremely pleased with this purchase. The vessel is very comparable to the much more expensive glass vessels I have seen in retail showrooms. Great purchase. This is an attractive and sturdy vessel sink. The silver and black combination is very striking so I will opt for understated surroundings. These are stunning sinks. Not installed yet, but can't wait to see them in place. This sink is absolutely gorgeous! Nice sink with great color tobe matched with blacks, whites, reds or gray. Sides walls are just a little too low so you will expience some water split if you have too much water pressure. This is going to be a great asset for our new bathroom. Due to a total loss from a fire, we are able to see the many quality items provided by Overstock. More shopping to get to. "What size / height faucet works best with this sink?" "Is this grey or black?" "What is the base dimension"
We will be downloading the dimensions diagram to the page shortly.